See the bottom of this post for information on the action by Fukushima's parents and NGOs on May 23 to protest against the Japanese government's decision to allow children in Fukushima up to 20 millisieverts of radiation per year, a decision heavily criticized by experts inside and outside of Japan. All are welcome to participate in this action. For more information on the matter in English and to sign the petition, see Green Action, MSCR (Moms to Save Children from Radiation), and updates on Fukushima crisis including this issue, see the Asia-Pacific Journal: Japan Focus. We need the foreign media to hear us! 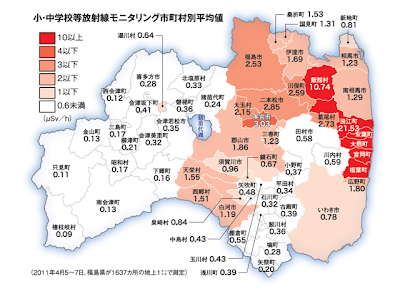 On Monday, May 23, 2011, we the Parents From Fukushima Prefecture will visit Minister Yoshiaki Takagi (the Minister of Education, Culture, Sports, Science and Technology) to plead that the government of Japan immediately reduces the safety limit of radiation exposure. We want the government to withdraw the current "safe exposure amount" of 20mSv per year to minimize children's radiation exposure. We want to speak to Minister Takagi in person about the dire situation of Fukushima children. Unfortunately, Minister Takagi, the vice Minister, and the parliamentary official all declined our request. Instead, Mr. Watanabe, Senior Deputy Director-General of the Science and Technology Policy bureau, will be the negotiating person. We find this attitude by the government of Japan to be crass, irresponsible and merciless, considering the extreme severity of this situation in Fukushima prefecture. Japanese authorities have been widely criticized for raising the safety standard of 20 mSv per year too high. We believe that Minister Takagi should explain to us why he won't reduce this safety standard. On Monday, May 23, 2011, Parents from Fukushima are protesting for Minister Takagi’s response. We need the foreign media to cover and report this developing crisis.